I waited for the weather to improve yesterday before I set off on my long run. By 2 pm it was clear that it wasn't going to get any better, so off I went, in heavy rain and a strong wind. I should have done 13 miles, but in the event, with breathing problems, and some very heavy going, I contented myself with just over ten, going out of Seaford to High and Over, across the downs to Bishopstone and back along the front, pausing at the sailing club to tip water off the cover of my son's dinghy. I had some encounters with brambles, so returned with legs covered in a paste of mud and blood. It was not without pleasures though, for just after High and Over I came upon a field of lambs, and there was fien view of the Cuckmere valley, mostly underwater. It's not been my best week: I di a shortened speed session on Tuesday, and missed a seven mile steady pace run on Friday, so this week's total is low. But on to week four. Having got wind of it through the Running Commentary forum, I ran for the first time with the Jog Shop Sunday morning Marina running group, choosing the twelve mile option when we reached Saltdean and divided. I found the pace hard to match as we went over Telscombe Tye, along on the downs, travelling some of the route of the Mince Pie Ten Mile, and then up the Snake and home by way of the racecourse. I now have a better understanding of the geography of that area. It was a good discipline to run with a group and have to move faster than usual, but I feel the effects today. Conditions underfoot were muddy, and, though the promised high winds didn't appear, there were strongish winds in some of the more exposed parts of the course.I see that I climbed 1289 feet in the course of this. It was fun to run with others, and I was pleased to run into some old running chums. I should have run a five mile steady pace run as well on Friday, but a cough prevented me. I am more or less recovered, but it may explain why I found yesterday difficult. Looking back at my training for Beachy Head, I was running 11- minute miles at the same stage in the programme then, so yesterday's 10.13 pace is good. Is it harder work running an unfamiliar route? I'm beginning to get really fed up with my Forerunner 205. I have used it for a couple of years now, and before that had a 301. I have also used older heart rate monitoring devices, though without GPS. My training now depends on the Garmin, and I cannot imagine training successfully without something like it. But it is very unsatisfactory. Here are the features I want in a runners' GPS device. It needs to pick up a GPS signal quickly. I do not live in a heavily wooded or highly urbanised area, but yesterday morning I had to wait three and a half minutes for it to pick up a signal. This is not unusual. When I bought the 205, I did so because it was advertised as being quicker to find a signal than the 301 I owned before. The reverse is the case. When I plug it into my Mac, I want it to be instantly recognised by the computer and Training Center launched automatically, just as, when I attach my camera or iPhone, iPhoto or iTunes are automatically started. It needs far better battery life. It is advertised as having. ten hours. This might have been true of my 301 but the 205 has been much worse, ever since i bought it. I'm lucky to get five or six hours before it needs recharging. The only advice Garmin support could offer was to do a reset, which I have done many times, but to no noticeable effect. I want something far more sophisticated than Training Center to manage my runs. Apart from the clunky look and feel of the application, I want to be able to manipulate data within the application, for example to sort runs by distance, date or any other factor simply by clicking on the arrow at the top of a column, as one does in any other application. I want it to import and export data much more easily, to and from a wider choice of file formats. In particular, it's crazy that every year Runners World publish allegedly Garmin-ready schedules, but in a file format that Training Center for the Mac doesn't recognise. Scheduling runs needs to work. The other week I constructed a whole sixteen week programme as preparation for London. When I transferred it tot he Garmin only the runs scheduled for Tuesdays went across. Why not integrate it with iCal, so I can schedule my runs in iCal and transfer them to the device? For the older runner like me, the screen, if one has more than one data element displayed, is very hard to read. And the buttons are not easy for arthritic fingers. Similarly, I am by no means deaf, but I find the alert sounds very hard to hear, yet there is no way to adjust the volume. Today I ran the first long run of this campaign of training for the 2009 London Marathon. The weather had improved, though windy, and I chose to run up to Firle Beacon and back, this being about ten miles. This is not far, and I shall be running double the distance later on in training, but it will do for a start. The Garmin misbehaved, of which more in a forthcoming post, and the run was hard, but the views were magnificent. As I reached Bo Peep, I came upon some penned sheep, controlled by a sheep-dog. One by one, they were taken to two shearers, who trimmed the fleece around their bottoms. After their treatment, they made an odd sight, with the clean shorn fleece around the bottom contrasting with the grubby wool elsewhere. I also ran three miles the previous evening. I ran my first speed session for several months on Thursday evening on the sea front, on my return from work. It comsisted of eight 400m fast runs with the usual warm-up s and cool-downs; though tired, I think it went quite well, apart from the usual problems with the Garmin. For my last run before the start of the sixteen week training programme for the London marathon, perhaps I should have done something different, even frivolous. But time was against me, so I merely ran seven miles, along the coast to Newhaven East Pier and back. It was cold and grey, and few walkers around. On the pier a solitary fisherman froze. Fashion notes: I wore a track suit, my warm running kit being in the wash. This was a mistake. The trousers are bulky and chafe unpleasantly. Under an uninvitingly grey sky, I ran five miles, out to the bottom of Seaford Head, but then through a farmyard and down to the Cuckmere valley, along the banks out to the mouth of the estuary, passing some bird-watchers possibly, if the Sussex Ornithological Society's sightings feed is correct, looking for some white-fronted geese. Then I struggled up Seaford Head and came home by way of the golf club. It was cold, and I was grateful for my long-sleeved shirt, though the hat and gloves I wore became too hot after a while. I have mentioned before that, while I think many great, world-changing thoughts while out running, I can rarely remember them after having returned home, showered and refreshed myself. This time though, for no particular reason I can think of, I found myself remembering the first time I saw someone make a soufflé. When I was in the sixth form at school, I made friends with an undergraduate couple, four or five years older than me, Cathie, a sociologist, and Dave a medical student. They were immensely kind and tolerant, for I must have been intensely annoying at that age. I remember visiting their house for a meeting and watching Cathie make a soufflé, continuing to expound a complex abstract point while beating egg whites in a copper bowl. Though we ate well at my parents' house thanks to Beryl, who cooked for us, the menus reproduced, though with much more art and skill, the food my father would have been used to at boarding school, at university and medical school and in the army mess. This self-styled 'plain' cooking, plainness being a virtue in those days, was in complete contrast to the dish I saw Cathie prepare dextrously and swiftly, and which we all three ate with pleasure. I had no idea that one could do anything with an egg other than boil, fry, poach it or, with two or three others, turn it into an omelette. Cathie went on to become a brilliant statistician, but to die very young aged 41. 15 March: Hastings Half Marathon. This will be the 25th running of this event, and my fifth. 26 April: Flora London Marathon. This will be my tenth marathon and my third London marathon. 7 June: Seaford Half Marathon. After that things are perhaps not so straightforward. 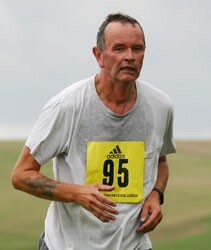 I need an autumn marathon, and could do the Seaford Marathon, Beachy Head, for the sixth time, or even an event abroad. I am tempted by the Marathon de La Rochelle, by Berlin, or even by the Athens Classic Marathon. Then, in a class of its own, there's the Jog Shop Jog, a little over twenty miles. Over shorter distances, I could enter the Lewes Downland 10 which I have never run before, the Firle 20k, the Brighton 10k and the Mince Pie Ten Mile.